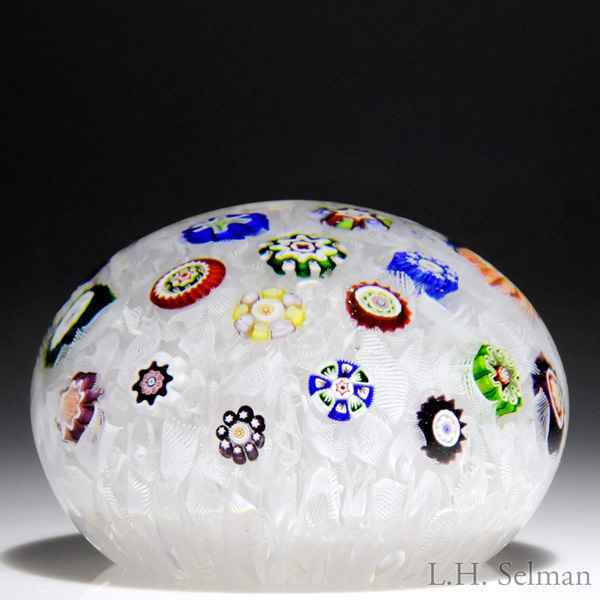 Antique Baccarat scattered millefiori on upset muslin paperweight. An unusual panoply of colorful and diverse millefiori complex canes includes one cane with tiny pink rose-like bull's-eyes ringed with yellow stars and a white border, another of alternating pink and yellow bull's-eyes, sawmills and a central quatrefoil, as well as the more ubiquitous arrow canes and cogs, over a beautifully arranged white upset muslin ground. Provenance: The Arturo Schroeder collection. See "The French Connection In Mexico. The Improbable Paperweight Path". Minor surface wear. Diameter 3 1/16".